2017 Toyota Rav4 Is Refreshed - Review, Release Date & Prices. What changes makes the 2017 Toyota Rav4 different? Expansion of high-tech safety features to all models, not just the most expensive, and addition of a new flagship trim level. The safety adjuncts include automatic emergency braking that can bring the RAV4 to a stop to avoid hitting another vehicle or a pedestrian. Slotting above the carried-over Limited model, the new top-dog Platinum comes with every RAV4 feature, plus exclusive touches like full-body-color exterior trim and a heated steering wheel. It’s available on RAV4’s gas engine and gas-electric Hybrid models. The changes update a compact crossover approaching the end of its design generation but still going strong in the marketplace. This five-seater is America’s most popular crossover, outselling the Honda CR-V and Ford Escape through the first half of 2016. True, Toyota’s been enticing shoppers with 5-year loans at 0% interest while Honda hasn’t had to be quite so generous with the CR-V. As good as the CR-V is, plenty of shoppers follow what they perceive as the best, and Toyota’s incentives have been compelling on a vehicle that can satisfy the needs of most compact crossover buyers. To get desirable safety gear even on the least expensive trim levels. Previously standard only on the Limited models, “Toyota Safety Sense P” (TSS-P) is now included on every ‘17 RAV4. This bundle adds pre-collision braking with pedestrian detection, automatic high-beam headlights, lane-departure warning that can steer the vehicle back if you wander from your lane, and radar-based adaptive cruise control. Also, if the formerly top-line Limited model wasn’t top-line enough for you, Toyota has you covered with the new Platinum. It comes with a number of amenities not offered on other models, though its pricing begins to encroach on premium-class territory. As for the rest of the line, the Limited carries over for 2017, along with the base LE, volume XLE, and sport-themed SE. All come standard with front-wheel drive; all-wheel drive (AWD) is a $1,400 option across the board. RAV4 is also the only compact-class crossover to offer a gas/electric hybrid option. These models are AWD only and come in XLE, SE, and Limited guise. Probably not. The current-generation RAV4 debuted for the 2013 model year and was freshened for 2016 with revised styling, new trim levels, and new features. We don’t expect the 2018 RAV4 to undergo any major updates, as a redesign is in the cards that will probably debut for 2019. Prices for the 2018 will also likely increase, so if you’re in the market for a new compact crossover, it would be prudent to seek a 2017 RAV4. Only by virtue of the Platinum’s unique visual touches. Lower-body plastic cladding that’s black on the other models is body-colored on the Platinum; there’s also themed interior ornamentation and badging. Otherwise, RAV4 carries over the mild facelift it received for model-year 2016. It was part of a midcycle freshening, an industry term for when a company updates certain aspects of a vehicle without major appearance, structural, or mechanical changes. The biggest change to the RAV4’s appearance was at the front end, where it received more-aggressive face. It’s a design language found in the Prius hybrid hatchback, and it will spill over into other Toyota products, including the upcoming 2017 Corolla compact car. 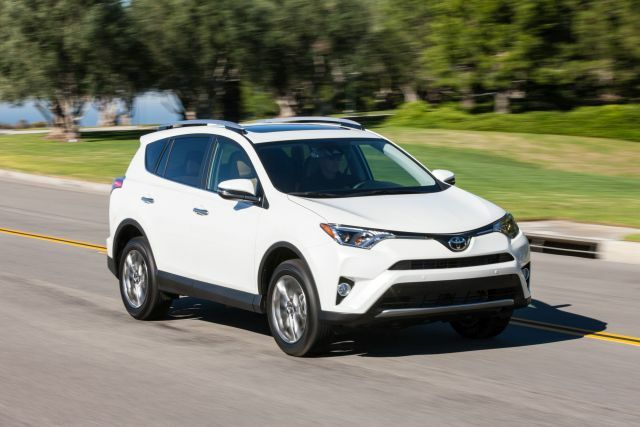 RAV4 SE models have slightly more aggressive looks, along with a lowered sport suspension and low-profile tires, but no other tangible performance improvements, such as a more-powerful engine. The company did not touch the RAV4’s impressively spacious interior. Passengers front and rear have ample room on comfortable seats. Both conventional gas and hybrid models boast cavernous cargo areas of 73.4 and 70.6 cubic feet with the rear seatbacks folded, respectively. Hybrids have slightly less due to the battery pack, which unfortunately results in a small hump near the rear seatbacks, making the loading of bulky items a bit more difficult than it should be. No. Like most of its conventional rivals, RAV4 offers a single four-cylinder engine, automatic transmission, and choice of front- or all-wheel drive. The previous-generation RAV4 offered a potent V-6 engine, but that was dropped for packaging and fuel-economy considerations. Your only choice now is a 2.5-liter four-cylinder with 176 horsepower and 172 pound-feet of torque paired with a 6-speed automatic transmission. Power is adequate around town, but the engine quickly runs out of steam when passing or merging onto a highway. It’s also far from the most refined drivetrain, as the engine produces a rather unpleasant racket while accelerating. Hybrid models are quicker and smoother, thanks to the instant torque offered by one of the two battery-powered electric motors. The gas engine is still a 2.5-liter four-cylinder but with 150 horsepower and 152 pound-feet of torque. The first electric motor is rated for 141 horsepower and helps the gas engine drive the front wheels. The second electric motor is located where the rear differential would be and provides power to the rear wheels in order to aid traction. EPA-estimated fuel-economy numbers for the 2017 Toyota RAV4 was not available in time for this report. We expect a 1-2 mpg drop from 2016, but this will be more a result of the EPA changing testing procedures to better represent real-world driving conditions. For reference, gas-powered 2016 RAV4 models run with their rivals, checking in at 24/31/26 city/highway/combined with front-wheel drive and 22/29/25 with AWD. Hybrids rule the fuel-economy roost among compact-class crossovers and likely will continue to do so when the EPA releases its revised figures. Their 2016 estimates are 34/31/33 city/highway/combined. As mentioned above, Toyota’s TSS-P safety suite becomes standard on every 2017 RAV4. Kudos to the company for doing this, not only across the board but without raising prices dramatically. 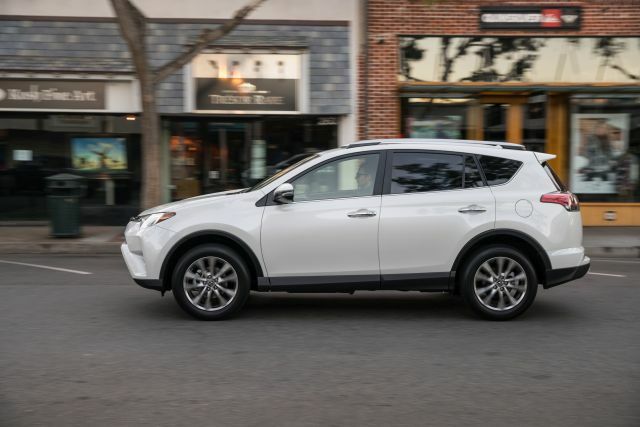 Similar features are available on other compact-class crossovers, but often only on high-end trim levels and/or at prices costing $1,000 or more. Honda and Nissan – take note. The new RAV4 Platinum model’s exclusives include a hands-free, foot-activated power rear liftgate is standard, as are a surround-view camera and heated steering wheel. Features on other RAV4 models carry over. All have standard Bluetooth connectivity, Toyota’s Entune infotainment system, and a rearview camera. 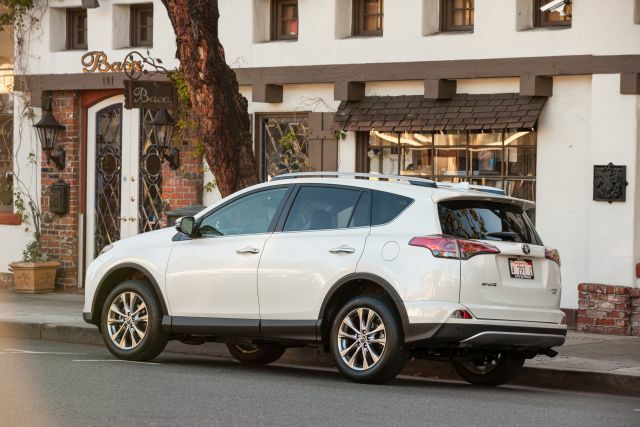 XLE and XLE Hybrid add dual-zone automatic climate control, sunroof, and a power liftgate. SE and SE Hybrid have a sport suspension, steering-wheel paddle shifters, blind-spot and rear cross-traffic alert, faux-leather upholstery, and heated front seats. Limited and Limited Hybrid have a power driver seat with memory, LED headlights, and a navigation system. Yes, but only marginally. Despite the addition of the TSS-P safety suite to the entire lineup, Toyota is increasing starting prices by just $320-$560, or about 1-2 percent, depending on model. At the same time, RAV4 is on the expensive side of the class. Note that prices listed here are for front-wheel-drive models and include Toyota’s $940 destination fee. The 2017 RAV4 LE checks in at $25,850; the XLE at $27,770; the Limited at $32,770; and the Platinum at $35,690. Add $1,400 for AWD. Pricing for the SE was not available in time for this report. The price premium for the Hybrid XLE and Limited is just $800 versus their conventional AWD counterparts. We think the extra cost and slight decrease in cargo room are worthy trade-offs since the hybrids have stronger acceleration, smoother drivetrains, and much better fuel economy. Depending on model selection, Toyota offers a variety of factory option packages that can include blind spot and rear cross-traffic alert, navigation system, surround-view camera, JBL audio system, and a cargo tray. These can add anywhere from $525-$2,460. How does it handle in the snow? RAV4’s combination of a front-wheel-drive architecture and reasonably sized tires means that this compact-class crossover generally acquits itself well in the snow. Optional AWD provides an additional measure of grip, but try before you buy. You may find that you don’t need to spend the extra money. The LE and XLE will deliver optimal traction in the snow, on account of their standard 17-inch tires. The SE, Limited, and Platinum will have slightly wider 18s, so they won’t handle quite as well, so you may want to more strongly consider AWD on these versions, but the difference is likely to be marginal at worst. Hybrid models will have the best handling in the snow on account of having standard AWD and a lower center of gravity due to the extra 300 pounds of curb weight from the battery pack and electric motors. Further, the hybrid system can provide instant power to the vehicle’s auxiliary systems, meaning that it can heat up the cabin faster on cold days. On the flipside, cold weather means the battery pack is less efficient, so fuel economy will suffer a bit, but again, we think it’s a worthwhile compromise. Release date for all models except the SE and SE Hybrid is by the end of August 2016. SE versions should follow shortly. Volkswagen Tiguan, which is far less spacious and can cost more than the Platinum despite fewer high-line amenities; and any of Jeep’s compact crossovers, the Cherokee, Compass, and Patriot, which have less-efficient interior packaging and poorer projected reliability. Honda CR-V and Mazda CX-5, both of which beat it for overall refinement and road manners; and the Nissan Rogue, which has a more comfortable ride, an available third-row seat, and a lower sticker price when comparably equipped. The addition of blind-spot and rear cross-traffic alert to the TSS-P suite; genuine leather upholstery, at least for the Platinum trim; and slightly lower sticker prices.